﻿﻿﻿﻿﻿﻿﻿The beauty of Resaca de la Palma is preserved amid the bustle of the Valley. Even though the agriculture and industry of nearby Rio Grande Valley cities creep ever closer, Resaca de la Palma State Park stands strong as a place where the landscape doesn’t change. The historically flood-filled resacas do need a little help to flow these days, but this refuge of thornscrub habitat remains virtually untouched by the hustle and bustle around it. Colorful butterflies float from flower to flower for nourishment, birds of every size and color inspect the trees and resacas for their next meals, and wildlife like the Texas tortoise patrol the landscape for tasty morsels. Really the only thing that changed with the park’s 2008 opening is the opportunity for visitors to connect with nature. Tram tours and guided hikes led by expert rangers and volunteers take you on winding paths through the thornscrub and over the resacas for an up-close and personal interaction with the residents. Those who prefer to tour on their own can rent a bicycle for a flat, easy pedal on the park’s paved roads. Resacas hold water for wildlife at the park. 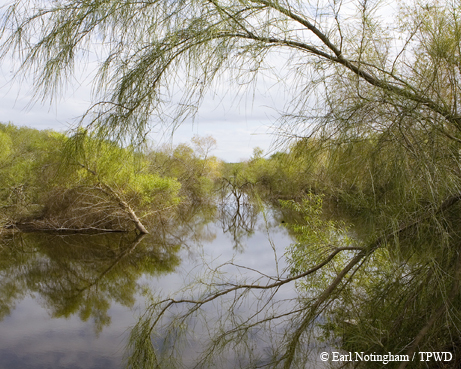 Many visitors come to discover the nearly 300 species of birds found at Resaca de la Palma — some of which are found only in this type of South Texas habitat. Birders from all over the world flock to the park to see colorful birds like the altamira oriole and green jay, or the less colorful but no less interesting groove-billed ani. An attention-getting part of the park’s soundtrack is the deafening alarm the plain chachalacas emit after spotting a perceived threat, like a bobcat or human. Birds aren’t the only fliers that flourish here. Stunning butterflies like zebra heliconians and orange-barred sulphurs work the flowers in the butterfly garden and frequently will investigate bright colors on visitors’ shirts, a delightful surprise for many. The park offers myriad programs for people of all ages throughout the year. There are weeklong summer camps for kids, with hopes of creating new stewards for places like Resaca de la Palma by offering an enjoyable, exciting outdoor experience. Fishing and geocaching are just a few of the many activities available. Feeling a little overwhelmed by city life? Work some of that stress away with yoga in the park or a 5K run through nature’s beautiful surroundings. Start new family traditions by joining park staff for a holiday event like the Jolly Night Hike in December or a First Day Hike on New Year’s Day. For more information, contact the park at (956) 350-2920 or visit the park website at www.tpwd.texas.gov/state-parks/resaca-de-la-palma.